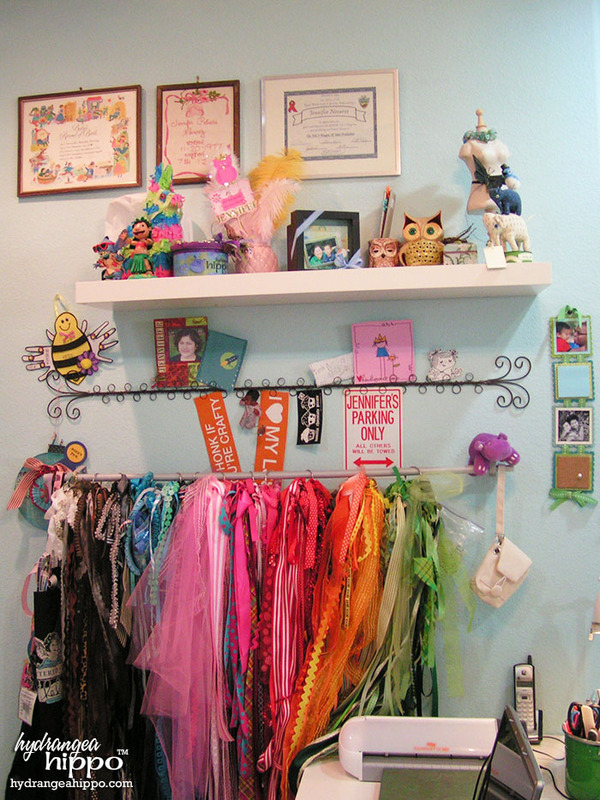 View of Jennifer Priest's scrapbook room circa 2010. 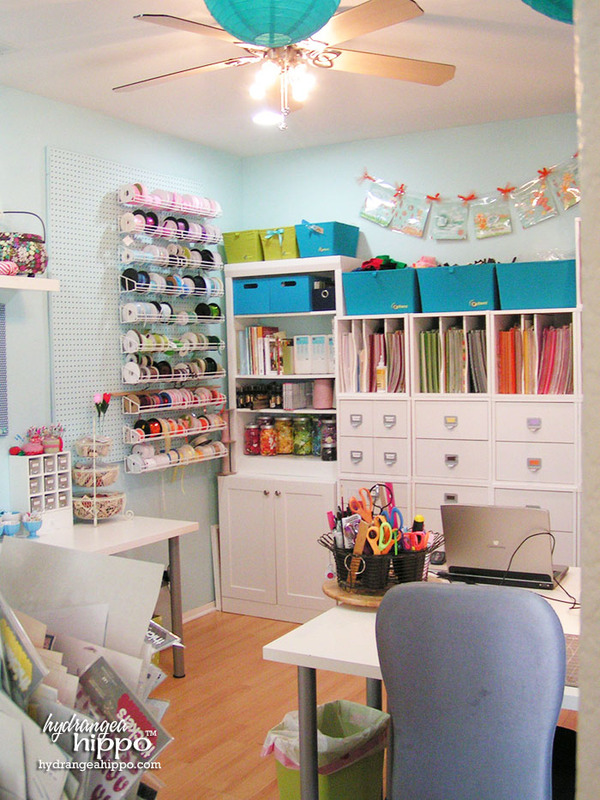 Die cut center, sewing area, storage, and ribbon wall in Jennifer Priest's Scrapbook Room. I used to have 3 tables in the center of the room and now I moved the bookcase on the left over and put the two tables on the one wall with 2 tables in the center of the room. 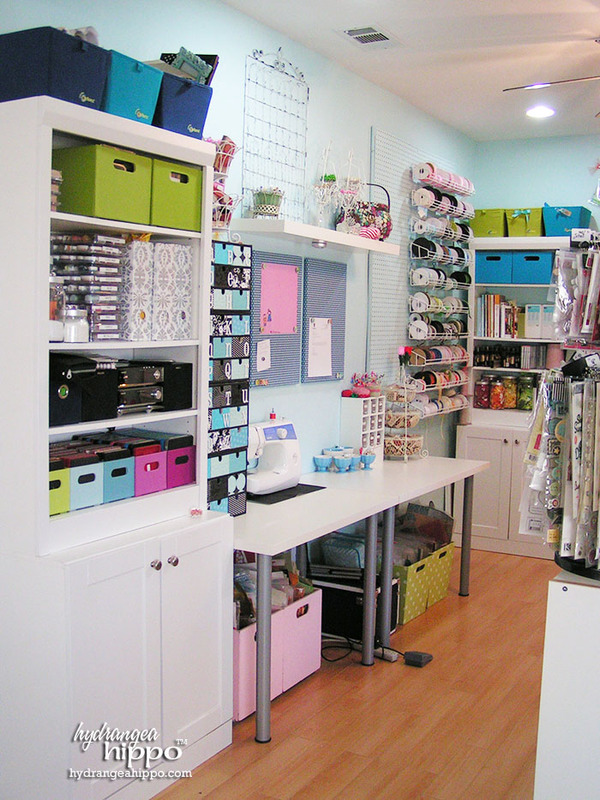 I really like having my sewing machine out and ready to go plus all this prep space is great for when I am working on big projects. Starting with that bookcase — I got it from Home Depot, similar to this glass door cabinet –the cabinet and the bookcase are separate pieces and were just over $100 together. 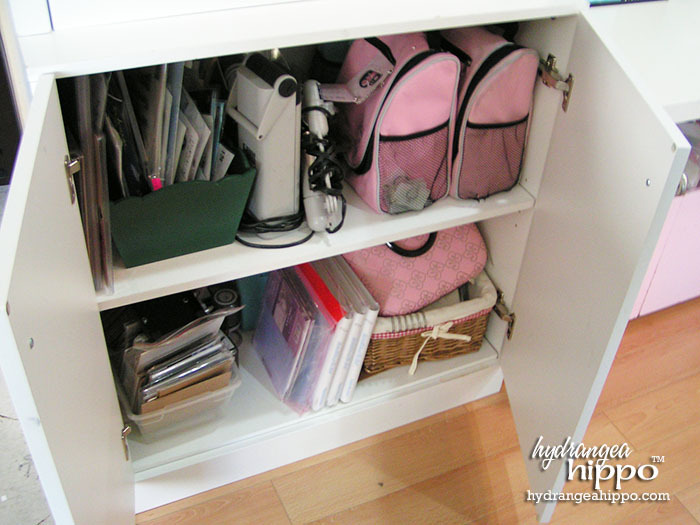 I love the cabinet to put messy stuff and I like the bookcases for stuff I use alot. 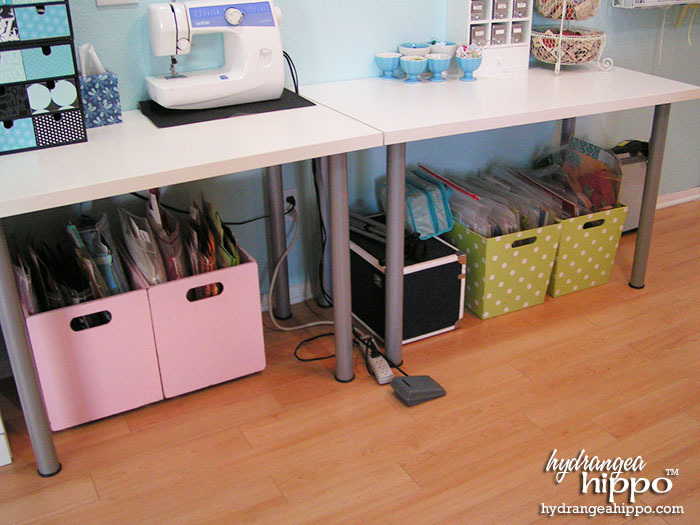 Die cut center, sewing area, storage, and Ikea FIRA boxes in Jennifer Priest's Scrapbook Room. Those colored bins are from Target and they fit Sizzix dies PERFECTLY! Who knew? I have a few more dies than this but I am trying to keep my collection to just this size. If I am not using a die, it goes on etsy (just sold a huge lot of 25). 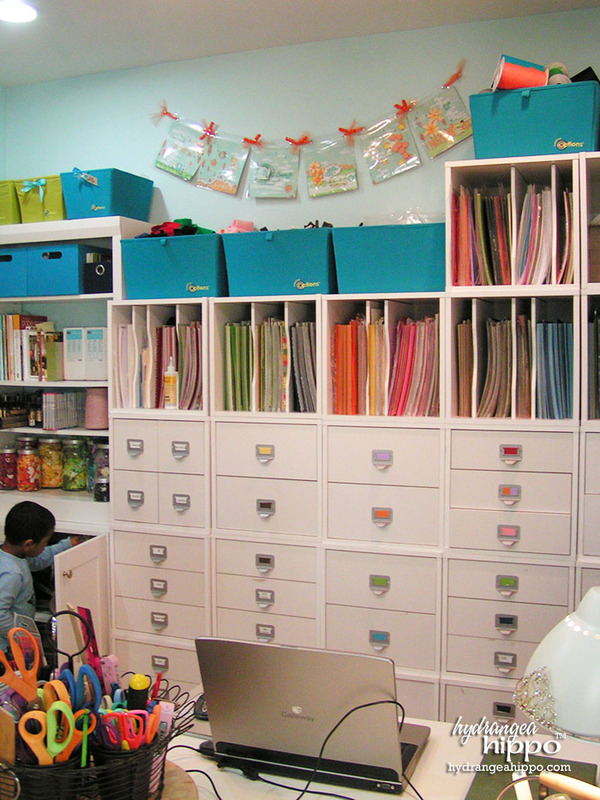 Sizzix Die Storage in Jennifer Priest's Scrapbook Room. Inside the cabinet is all my Bind It All stuff. I do not like to sort by manufacturer but with Bind It All, I kind of have to — that's the only acrylic, clipboard wood, etc that I have so it is easy to keep it all in one spot. And it is easy to roll my chair over here when I am creating class samples to flip through product and choose what I need. Large Tool Storage in Jennifer Priest's Scrapbook Room. 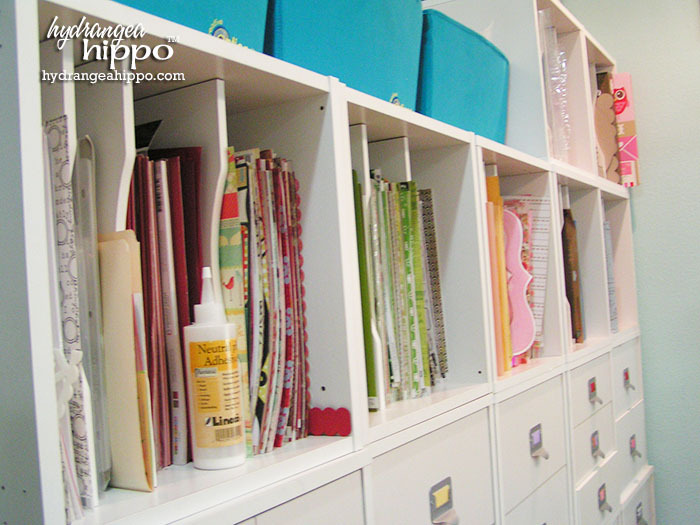 Chipboard Letter Storage in Jennifer Priest's Scrapbook Room using Ikea FIRA Boxes. Moving over to the right you can see these boxes with drawers with letters on them — those are Ikea FIRA boxes that I assembled, Xaver spray painted them black, and I covered the box fronts with papers from a Polka Dot Whimsy kit. I used one pack of chipboard letters to label each drawer–inside each drawer are chipboard, metal, and diecut letters for each letter of the alphabet. The drawers without labels are Punctuation and the Numbers 0-9. If you want to recreate this you'll need FOUR FIRA 9-drawer boxes from Ikea. Sewing Center in Jennifer Priest's Scrapbook Room. The things holding my stick pins are actually candle holders I got at a flea market — love them! And the bulletin boards below that were from Tammy I–she covered them with this cute polka dot paper — they are the same white magnetic Ikea boards I have on the other side of the room (you'll see later) just a lot cuter. Under the table storage in Jennifer Priest's Scrapbook Room. Under the table are bins from Target. The pink ones are from the kids' section and have wheels on them — I love these but they are starting to split open at the sides because Matthew thinks he is supposed to ride in them while Katie pushes him really fast….hmm. Anyways, the pink ones are filled with HUGE ziplocs full of scraps, sorted by color. This really helps me to use them up more but honestly, I still make scraps faster than I can use them. Target doesn't have these actual bins anymore but if I were to buy again, I'd get these metal bins! 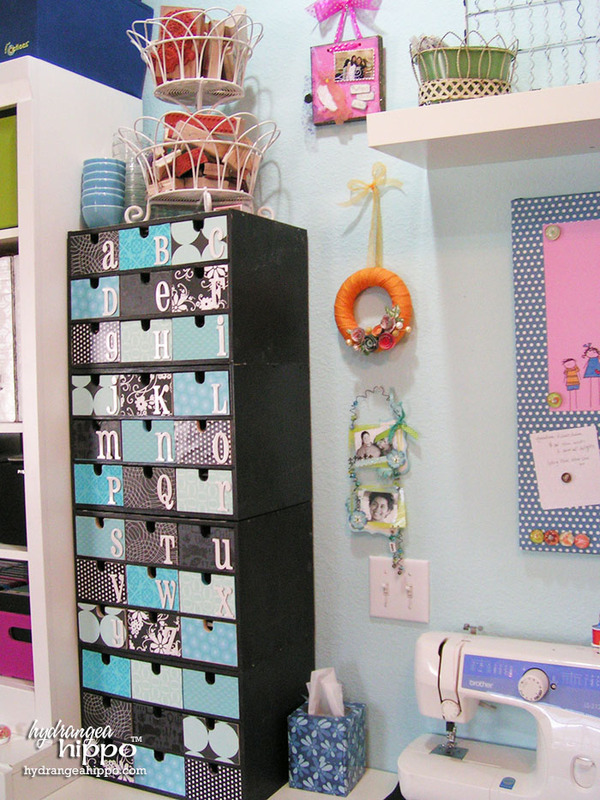 Peg Board wall and ribbon storage racks in Jennifer Priest's Scrapbook Room. In the green bins (also from Target) are some page kits and projects I am currently working on. I also have a Rubbermaid tub of kits in my hall closet (I know, the “scrap” is everywhere in my house). I try to work through these kits in the bins first and then replenish them with kits from the closet. Here's a closeup of my second Home Depot bookcase, in the corner. I have Quickutz dies inside the bottom and a few tools. Flower Storage in Jennifer Priest's Scrapbook Room. Crop In Style Store In Style Cubes Scrapbook Storage in Jennifer Priest's Scrapbook Room. Moving to the right you can see my “Wall-O-Cubes” — that's right, I think maybe 23 or 24 Crop in Style Cubes. Plus Matt getting into more trouble… Crop In Style went out of business so you can no longer get the cubes. 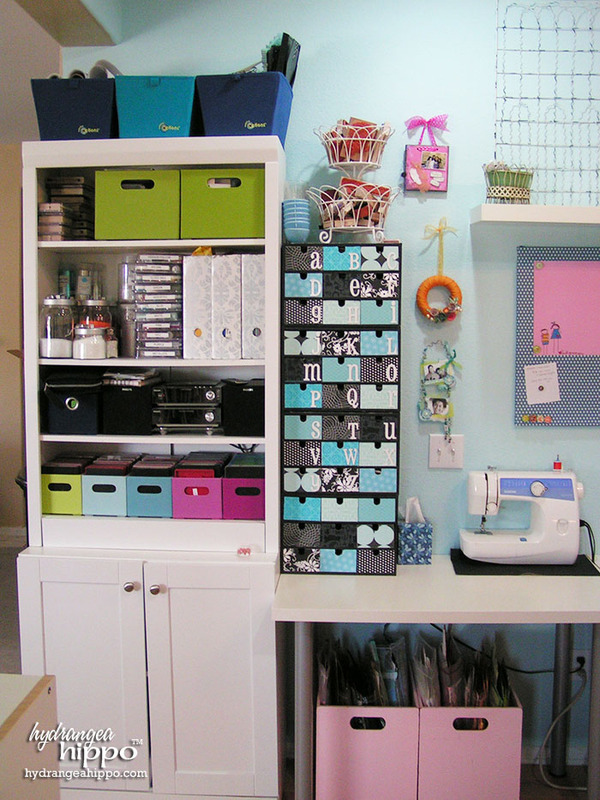 JetMax makes similar craft storage cubes – they are not as heavy duty but alot of crafters use them. All of my embellies are in here by color and I just LOVE this system. I just label the drawer using a scrap of cardstock that matches the stuff inside. 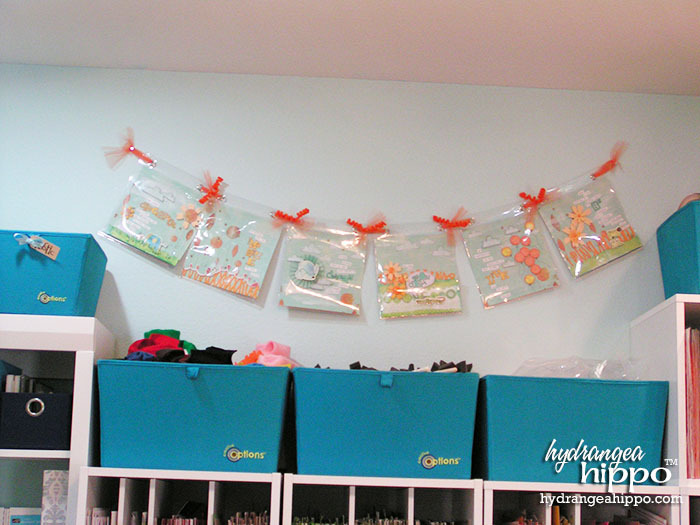 How to Store Embellishments by Color in Jennifer Priest's Scrapbook Room. You can see my little dot boxes in there with little bins of fun embellies in that color. 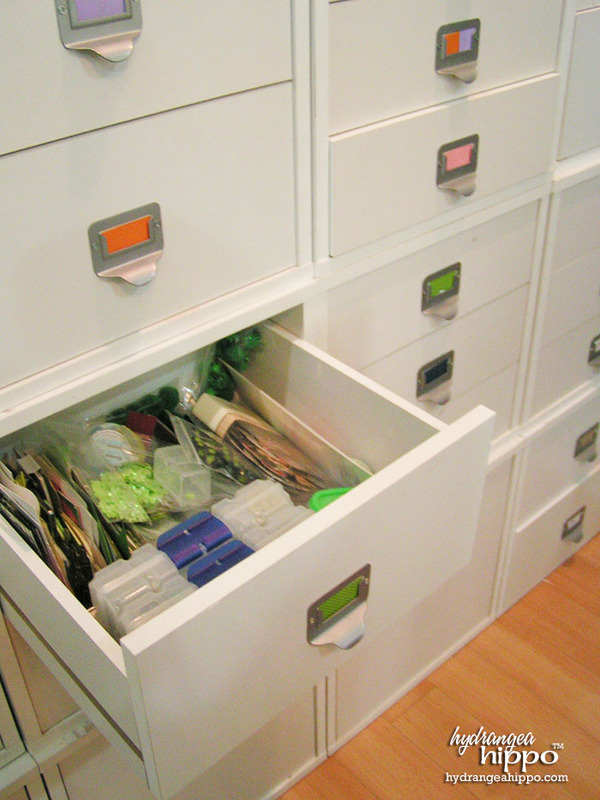 The drawers are alot more empty now–I've been using stuff, purging, and just trying to stay organized. I have finally convinced myself that just because a drawer is there does not mean it has to be FULL. 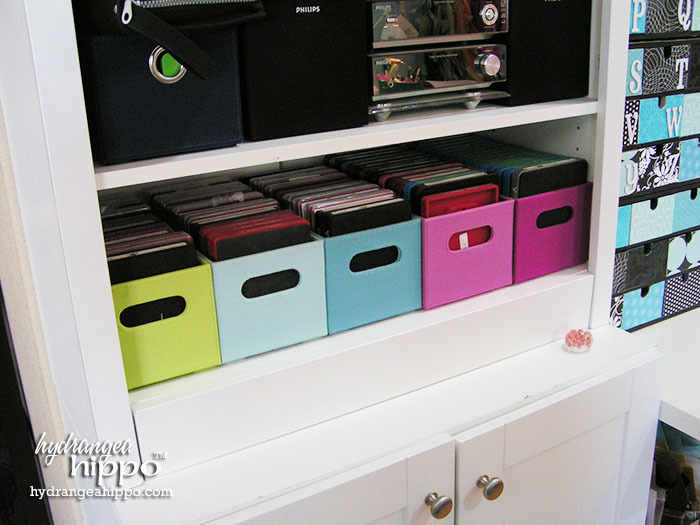 How to Store Paper by Color in Jennifer Priest's Scrapbook Room. And my paper is arranged the same way, at eye level and a little above that, all by color, cardstock on the left, patterned paper on the right of each color section. Cute banner hanging in Jennifer Priest's scrapbook room. Over my cubes is this fun banner I made using Prima papers, page protectors from the Canvas Albums they offer, plus a bunch of flowers and the stitched mulberry paper animals. Each panel has a quote I love. I also have some Options totes filled with bulky stuff like felt, tulle, bags for classes, and foam paint brushes. The ribbons are held up by a curtain rod with brackets that extend about 4″ from the wall, both from Ikea. Above that is a wire note holder from PierOne, $10. And then a floating shelf (Ikea) above that. I moved all my display goodies over here plus we put up some of my framed stuff that doesn't go anywhere else in the house–a fake award I got from a job, my birth certificate, and an embroidered piece my mom made for me when I was a baby. The cute little hippo on the ribbon rod is from my friend April–cannot believe she found a purple hippo! Love it! This is the view from the “window”/pass-thru from my front room to the scrapbook room. A Clip It Up is a great way to organize stickers by theme! I have my Clip It Up on this little dresser from Ikea. They discontinued the dresser, sadly — it fits the Close To My Heart 6×6 Acrylic Stamp Envelopes PERFECTLY! I have been slowly moving all of my non-CTMH stamps to these envelopes. 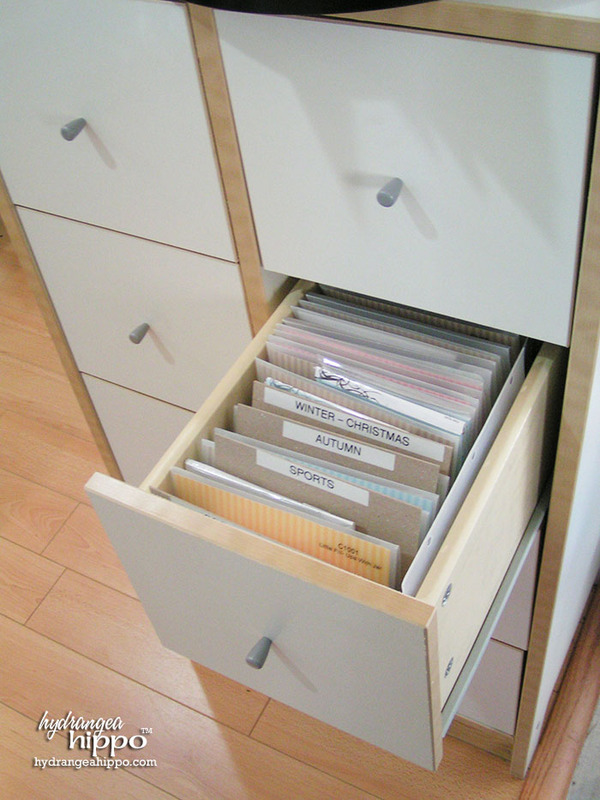 Each drawer is divided into sections by theme using just a nice thick piece of chipboard and a label from the label maker — nothing fancy, just does the job. Look for drawers that fit your item perfectly, like this chest that fits CTMH stamps. Ikea doesn't make this anymore but you can find them on Craig's List. 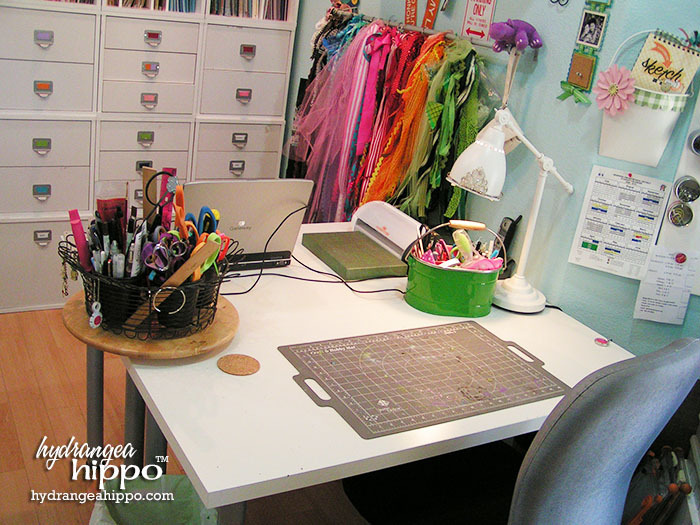 Keep a craft mat on your table to protect it from cuts, marks, and paint. One table is for scrapping and the other has my laptop and Silhouette on it full time. Like the sewing machine, I use it more if it is out, set up, and plugged in. I hate to give up the table space but I could say it is worth it because I am using that expensive machine a TON more! The container with my pens and tools is an herb pot from Crate & Barrel on a wooden lazy susan from Ikea. Matt and Katie sometimes spin this and my stuff goes flying…they kind of know not to do that now but every once in a while I gotta get on Matt for starting to spin it. To the right of my scrap table is this weird triangle shaped section of room that has a window right next to the front door–handy for when I see the UPS guy coming! 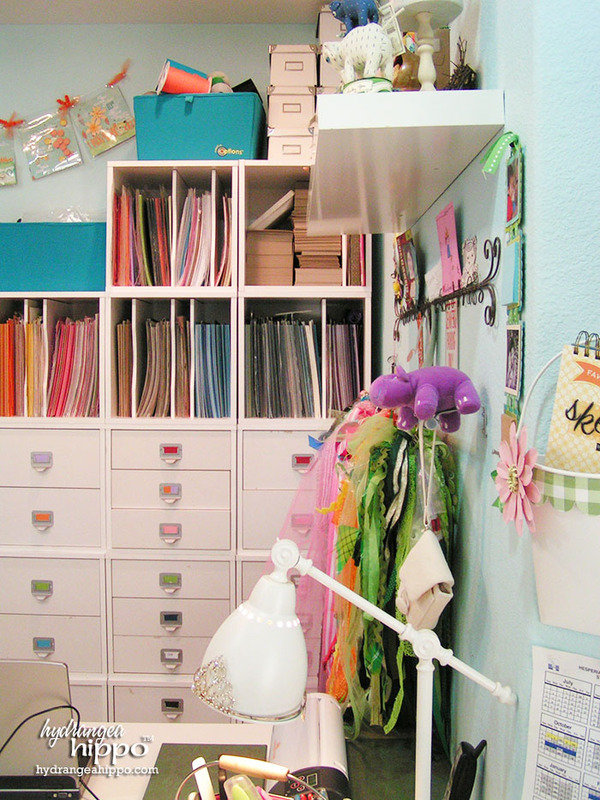 Put projects you're planning to work on in Art Bins. They stack nicely too! Behind that is this little desk pictured above (from Ikea again, must remember to buy stock in that place) that used to be Katie's. It has bins with crepe paper, ribbon, Silhouette mats and blades etc in it. My Sizzix Big Shot and the Epic are on top, for easy access in hopes I will use them. This is not working out as well as I would like since I would love to store them where I can use them. There is just not enough space on this desktop to use them so I have to move them to use them. 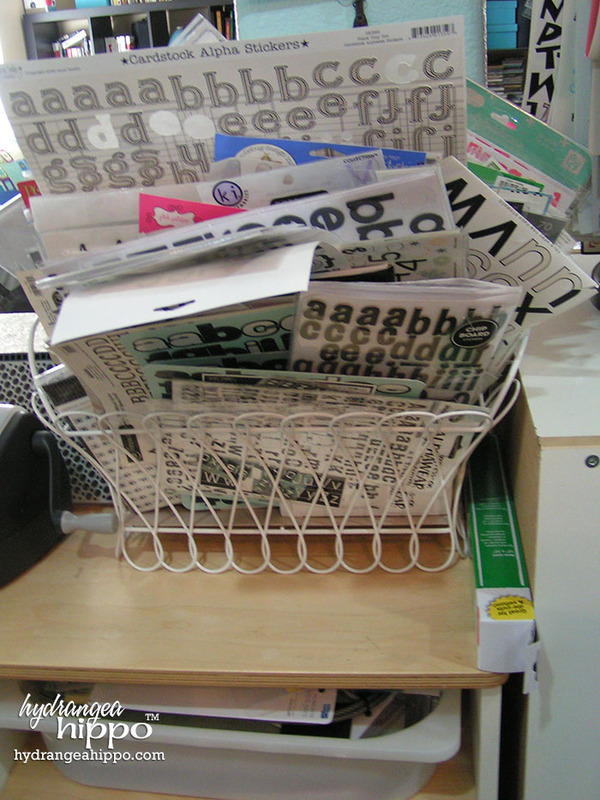 Use a wide wire basket to store your sticker letters in for easy access. Keep up with our crafty adventures by subscribing to the Hydrangea Hippo Crafty Newsletter. DANG!!! You have a scrap store here! This is so beautiful (and organized)- so pretty! Awesome scraproom lovin it jen…. Your space is so organized and clean. When I scrap it looks like a tornado came through! Awesome room thank you so much for sharing. MY goodness you could open a scrap store in your own house! I love your organization! I have a cube system too and I LOVE IT!! I also did something similar with my ribbons! I am so absolutely jealous of you! I want a room just like that! I’ve been in stores that didn’t look this nice! 🙂 You did an excellent job and now we’re all expecting even greater things from you. lol. Beautiful *and* functional – how awesome is that? Great room! I have one of those garden gates too, mine came from Papertales. Thanks for the tour. ahhhhhh,,, talk about a heaven on earth!!! thanks for sharing with us!! I LOVE your creative space! The colors you chose are so soothing! I love the new reorg, makes me wan to finally finish my room. Well, I will be when the budget allows. And you had some great ideas. And I use those same boxes just different colors to hold my Big Kick dies too – they are just perfect!!! Oh mercy……your room is fabulous. Love all the cubicles. 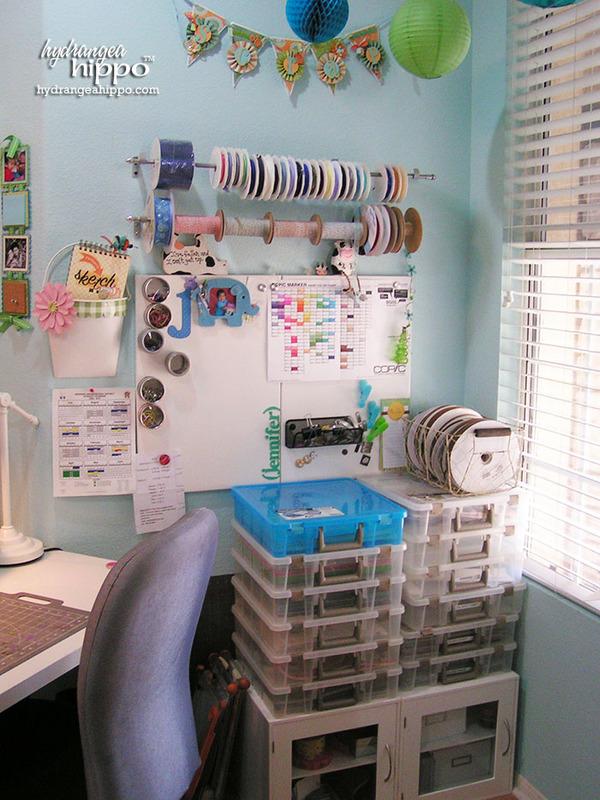 im super jealous!your scraproom is like every scrapaholics fantasy!! !this is great! Your room is awesome. I wish mine were half that organized! Awesome room! Love the organization and colors!!! Well clearly you need to come to Boston and work on my organizational mess! LOL – beautiful room, Jennifer! 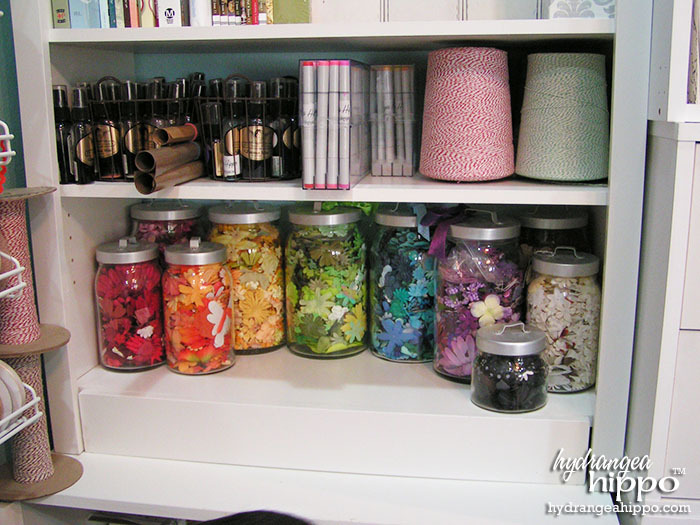 Love your room, I am more of a sewer and have been looking for a way to store my ribbons. Was planning on doing a curtain rod, and saw that you had done it too. 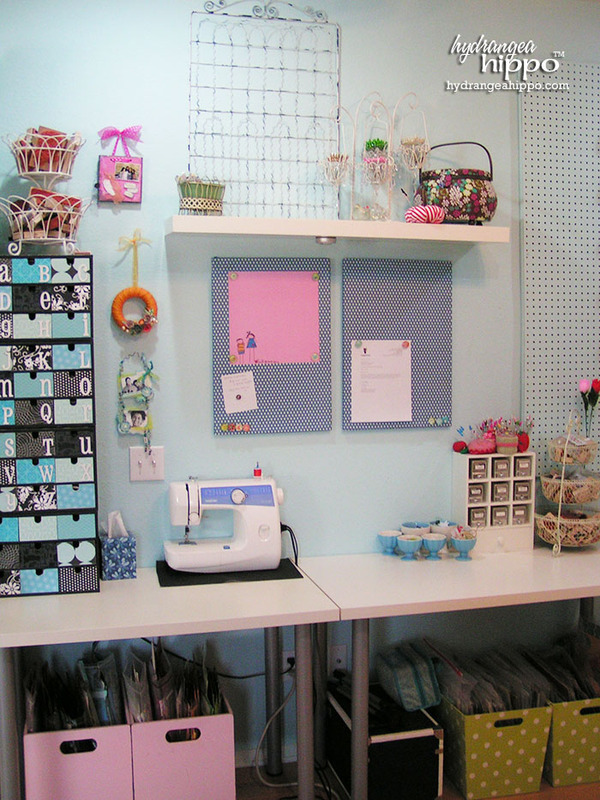 Though I really like the pegboard and the shelves. Our closest Ikea is over an hour away (from 10 minutes where we used to live); but we will be taking my SIL to airport next week, and that’s only 15 minutes away from there. That and Container store. Love them. Thanks for sharing. Very cool Jennifer! 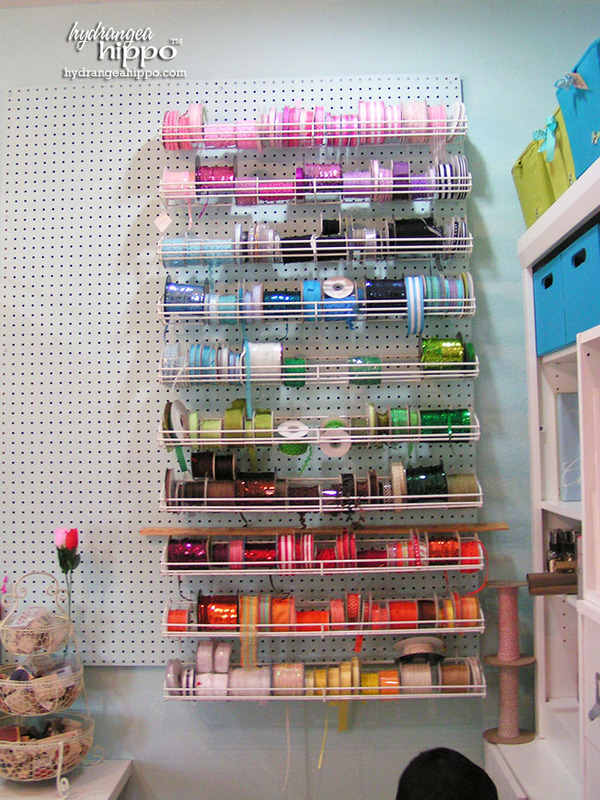 I am working on my scrap room and should have bought stock in IKEA as well – love your ribbon rack – such a lucky find! LAWD, Scrapbook HEAVEN. May I go play? Your room is AWESOME. This is pretty and well done by a real person. I am no way as organized as you are. You’ve done a great job and with kids! (into everything). You are pretty amazing! You’ve proven I can get all my crap put away. Love your room. I have been purging and re orgsnizing thecpast few days. Like you i have to have it out to use…..moved my cuttlebug and cricut to be within arms reach. Love collecting alphabets too! Your room is wonderful! My “Momma-Cave” is a similar color (love it), and you are a visual person just like me. I have to have my things out for creative inspiration but also want them organized. You’ve done a wonderful job! Really love your room and it gave me a lot of ideas for mine. Was wondering about the FIRA drawers from Ikea. I live near an Ikea and looked online for Fira drawers and the search didn’t find anything. Could they be called something different? I’d really like to get some of those. Awesome!! Love the bright colors. Wow, you are the queen of creative and inventive use of space and materials. Ikea should consider using you as their official poster child. I am sure that the Ikea design team has never dreamed of your innovative use of their products. 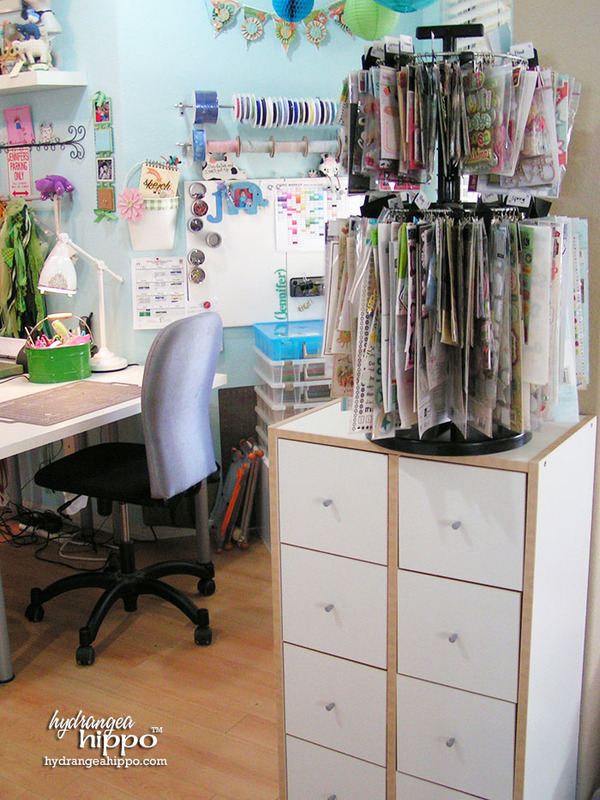 I am now off to clean and organize my craft space since I am suffering from a bad case of craft room envy! Hi Jennifer!! Wow! What a beautiful, fun and inspiring place to work!! The colors are brilliant and the layout is perfect!! Thank you so much for your sharing this with us! Your room is amazing! I’m reorganizing my room and you have given me lots of ideas. 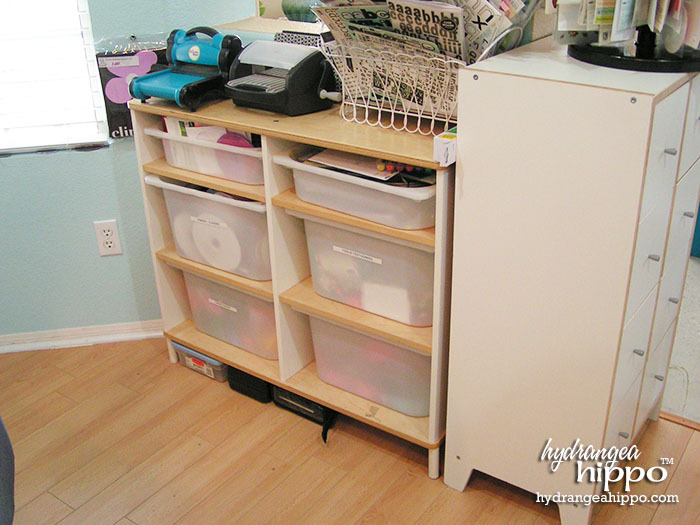 I love the FIRA shelves from Ikea, but I looked online at Ikea and couldn’t find them. I live by an Ikea so now I need to make a trip to see if I can find those. so pretty. love the new organization. i agree….practical and at hand is better than pretty. so jealous you have so much space. Oh my gosh–this is AMAZING!!!! No wonder you create such fun stuff–your workplace must inspire you! Totally jealous (in a good way, though! LOL!)! 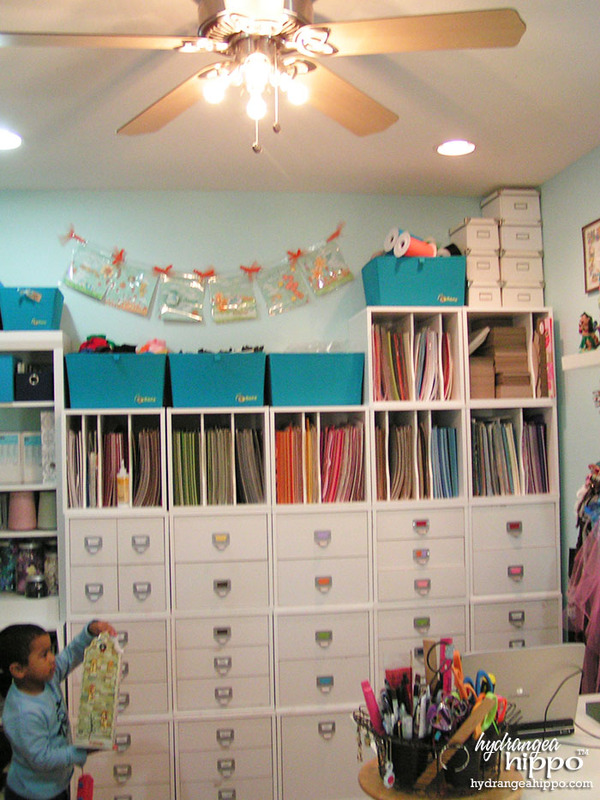 Love your scrapbook room and how organized it is. I am looking to turn my dining room into a scrapbook room and found lots of great ideas. I really like your tables. What are the dimensions and where did you find them? Do you find them big enough for a workspace? I got them at Ikea. I’m not sure of the dimensions but it was a few years ago. I clean my table every time I make something and I only have the stuff on it I need right now. Hope that helps! What kind of cabinet did you use under your bookcases? Is it a kitchen cabinet or something different? Where did you get them? The bookcase and under cabinet were in the home organizing section of Home Depot. They don’t carry them anymore so I linked some alternatives in the blog post. Hope that helps! 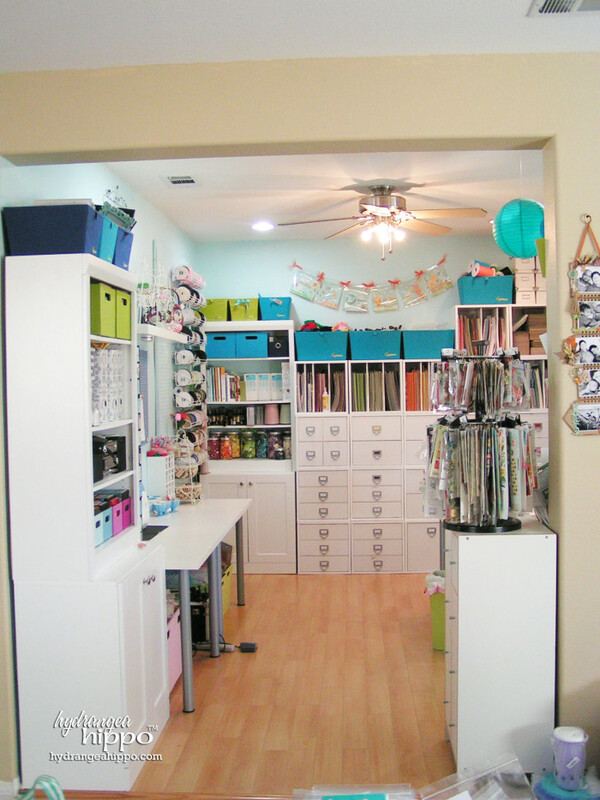 JP, what are the dimensions of your craft room? I don’t know where you live, but I really need help. I’m 60+ years old and just moved in to 55+housing I’m using my dining room as my craft area. I just don’t know how to organize therefore I am not very productive. HELP!!! Look into hiring a professional organizer to help you or even put an ad in the paper and get a high school kid to help out. Hope that helps! I have been surfing the web, store sites and Pinterest and your room is by far the best I have seen yet. You are very creative in how you put it all together. It has functionality as well as looking very neat and organized. Thank you for taking the time to share.